The Formula 1 circus arrived in Zandvoort with Williams in dominant form, the team having won three successive victories at Silverstone, Hockenheim and Zeltweg. The scoring system meant that each driver could keep only his four best finishes from each half of the season and as Jones had collected only four points at the midway point he knew that his maximum score for the year would be 40 points. Jody Scheckter had amassed 30 points in the first part of the season and so Jones was not really a threat and the South African had picked up five points and needed only six more to be sure of beating Jones. The threat to Ferrari from Ligier and Lotus had faded completely. 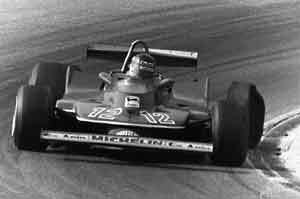 Scheckter's only real challenge therefore came from his teammate Gilles Villeneuve but as he was the Ferrari number two driver, Scheckter's position was solid. The only change in the driver lineup was the return to action of Jean-Pierre Jarier after being out of action with hepatitis for two races. There was an unpopular new chicane out at the back of the track. In qualifying Rene Arnoux (Renault) was on pole from Jones, Clay Regazzoni (Williams), Jean-Pierre Jabouille (Renault) and the two Ferraris, Scheckter ahead of Villeneuve on this occasion. The top 10 was completed by Jacques Laffite in the Ligier, Keke Rosberg (Wolf), Niki Lauda (Brabham-Alfa Romeo) and Didier Pironi (Tyrrell). At the start Jones took the lead but Arnoux found himself in a sandwich with Regazzoni on the inside and Jabouille and Villeneuve on the outside. Arnoux thus collided with Regazzoni (the Williams losing its left front wheel) and Arnoux damaging his rear suspension. Thus Jones was followed into the first corner by Villeneuve, Jabouille and Pironi. Scheckter was left behind and started at the very back of the field. Lauda did not last long as he had hurt his wrist in a Procar accident and he was forced to withdraw. While Scheckter charged up through the midfield, the order remained stable at the front although fifth-placed Laffite dropped away early on because of a misfire. Rosberg took over. On lap 11 Villeneuve overtook Jones on the outside at Tarzan Corner to grab the lead and on the next lap Rosberg moved the Wolf ahead of Pironi's Tyrrell in fourth place. Pironi later drifted behind Scheckter who then caught and passed Rosberg and profited from Jabouille's retirement with a clutch failure. On lap 47 Villeneuve spun and Jones went back into the lead (despite having gearbox trouble) and four laps later Villeneuve's left rear tire exploded and he spun again. He rejoined and drove an entire lap on three wheels. When he got to the pits the suspension was too badly damaged to continue. And so Scheckter finished second and after Pironi went out with a suspension failure third place went to Laffite with Piquet fourth, Jacky Ickx fifth for Ligier and Jochen Mass sixth in his Arrows.